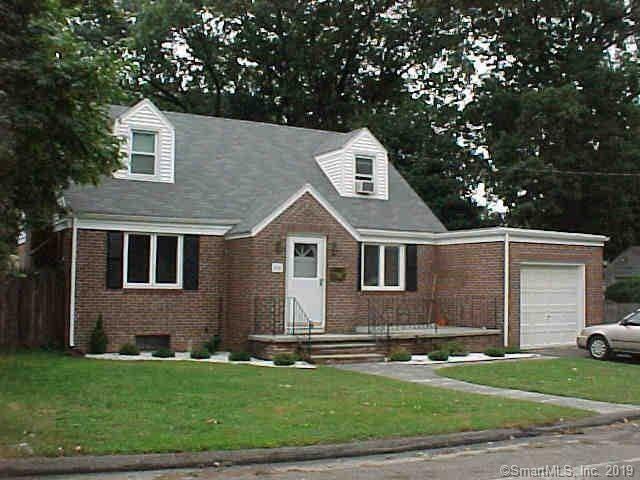 WATERVIEW IN RIVERCLIFF, MILFORD CT - LOCATION, LOCATION, LOCATION This lovely solid brick Cape Cod has character, charm and an easy commute to NYC. The main level features hardwood floors, an inviting living room with working fireplace, and large dining room or den, and a large main floor bedroom, kitchen, full bathroom w/ tub and replacement windows. Upstairs boasts two large bedrooms including a master and full bath with tub. Basement is fully finished and separate laundry room with extra storage. Outside a fully fenced backyard is great for pets, w/ small deck for hot tub and wooden storage unit. The front porch faces the natural beauty of the Housatonic river (in a no flood zone). This warm inviting home has private space for each family member. Minutes to the train, shopping and schools. Perfect for dog walking, bike riding and only one mile from the ocean. Rivercliff is a prime, safe, family-friendly neighborhood, in Milford, "the little city with a big heart." An hour commute to New York City and 10 minutes to New Haven and Yale. Buyers agents or qualified potential homeowners only, please call for showing. Thank you! Directions: South To North 195 N To Exit 33.over Bridge, First Right On Rivercliff, Right On Housatonic. Drive, Left On Regent Terrace. North To South, Take I 95 South Exit 34. Right Off Exit, Left On Rivercliff, Right On Housatonic. Left On Regent Terrace.